As reported by the Edmonton Oilers official twitter page, the team has signed forward Ty Rattie to a one-year deal next season. Sportsnet’s Elliotte Friedman followed up that the deal comes with an $800,000 cap hit. Rattie had nine points in 15 games after being recalled by the Oilers. 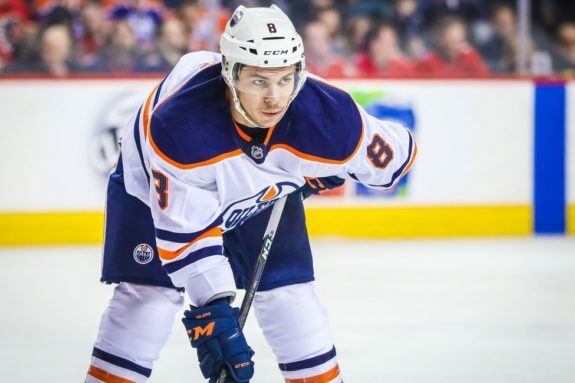 He finished the year on Edmonton’s top line with Connor McDavid and Ryan Nugent-Hopkins. The deal officially avoids the prospect of the 25-year-old testing the market as he would’ve been an unrestricted free agent (UFA) this summer. This now gives the Oilers some interesting options on the wings as they’ve now got several signed heading into next season. The problem is they don’t have much in the form of proven 20-goal scorers. Still, there’s intrigue with Rattie. He’s a valuable player, and this is a good deal that, if it doesn’t work out, can easily be traded or sent to the AHL without many ramifications on the overall salary cap. As Zach Leach from Pro Hockey Rumors mentions, this signing has to be a relief for Rattie. He’s bounced up and down between the AHL and NHL for several seasons. In 2016-17 he played four games with the St. Louis Blues, got claimed off waivers by the Carolina Hurricanes, only to end up back in St. Louis after being placed on waivers again. The Blues didn’t tender Rattie a qualifying offer, thus he became an unrestricted free agent, and ended up in Edmonton. This season Rattie had his best season from a points-per-game perspective in the AHL (0.81). The knock on Rattie is that he’s been a great scorer in the AHL, but hasn’t found consistent success in the NHL. For what it’s worth, he looked like a capable player lining up with McDavid and RNH. Oilers head coach Todd McLellan must’ve really liked the trio together as they played the third-most minutes together this season (128) than any other Edmonton line combination. The line’s Corsi For (CF%) was a respectable 50.1%, but it’s unclear where Rattie will play next season. Still, it’s hard to ignore the signing doesn’t add some form of depth to the wing situation. On the right side going into next year, the Oilers have Kailer Yamamoto, Jesse Puljujarvi, Ty Rattie, Anton Slepyshev, and Zack Kassian already. Slepyshev and Kassian can play both wings, so maybe one of them slides over. Regardless, this is a great signing for Oilers general manager Peter Chiarelli. If Rattie can show he can play long-term on the McDavid line he’ll prove to be an excellent value signing. That’s something you need in today’s salary cap world. If he ends up struggling, the team can send him back to the AHL to play with what could be a very good group offensively next season. Tyler Benson, Cooper Marody, Cameron Hebig, and Colin Larkin will be a part of the transitioning core which should be better offensively than what Bakersfield had for much of the year. Add in the possibility of Yamamoto and that’s an excellent group on the farm. There’s plenty to like about this Rattie signing. The dollar figure and term are so low, the risk and possible negative impact are very low. Internally this is what the Oilers projected roster looks like for 2018-19 without any trades. The asterisks next to Anton Slepyshev and Iiro Pakarinen are because there’s a likelihood neither are here next year. The asterisks next to Tyler Benson and Kailer Yamamoto are to show where they sit heading into training camp. Both have an outside shot at making the team. With all this said, there’s one thing that stands out. Edmonton still needs a proven 20-goal scorer in their top-six. Most fans would be over the moon if they could add a 30-goal scorer somehow. If they go with the status quo, which they shouldn’t, the team will once again be a scoring by committee type of deal. The status quo isn’t deep enough to go toe to toe with the Western Conference powerhouses. Add a consistent 20-30 goal scorer and suddenly things look better. It’ll be interesting to see where Rattie slots in next season. If the depth chart stays pat, maybe Rattie returns as the Oilers low-risk, low-cost option on right wing for the McDavid line. Still, you’d hope the team still goes out and signs someone to help out in the top six. Regardless, you have to give kudos to Rattie for earning his breaks this season. He deserved this contract, and now has a real opportunity to be seen as a full-time NHL’er for the first time in his career.